Coleraine boss Oran Kearney believes former Institute midfielder Ciaron Harkin, has a big future ahead of him. 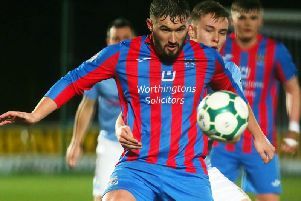 The talented midfielder has taken to Premiership football like a duck to water as he has played five and won five, during the Bannsiders’ impressive run of eight victories in a row. “I remind Ciaron after each and every game that the Premiership isn’t easy,” stated Kearney. “I also told him that when Lyndon (Kane) made his debut at 17, we won four on the bounce and again then it was the same jokes about this league is easy, but to be fair I was in Ciaron’s ear, especially after our fourth win that, Lyndon had done that the same, so I was glad that Ciaron was in the side which defeated Dungannon and got us over the line. “He has been a great signing and a great fella and last Friday night I think it was a nice one for him, having come through and having a big association with Derry City. “He was keen to go out and perform well, which he did. I think it has been a great move for him and I feel he has a real big future ahead of him. Unfortunately Harkin misses this weekend’s trip to Cliftonville, much to Kearney’s annoyance.